The latest iteration of the Guitar Hero franchise, Smash Hits is exactly what it sounds like: a compilation of the best songs from previous Guitar Hero games. One one hand, the entire idea of a greatest hits game reeks of "easy cash grab", especially given Activision's reputation for milking franchises dry. On the other hand, these songs are indeed great, and they are fun to play, even the second time around. The true value of GH Smash Hits lies somewhere between these two extremes. So what has changed, gameplay wise, about Smash Hits? I was unable to find any difference, no matter how minor, between this game and its immediate predecessor, GH Metallica. The Expert+ setting on drums is the most obvious returning feature. Additional tweaks like an in-song star gauge, individual rock meters, and Metallica's other minor improvements remain, as well. Beyond this, there's not much else new to speak of, as far as gameplay is concerned. There is a loose story in Smash Hits, for what it's worth. (Does anyone really play these games for the story?) Four favorite rockers, including Axel Steel, my personal favorite choice, are recruited by the God of Rock to reunite as a band. The band plays at some admittedly spectacular venues, such as the Grand Canyon, the Sphinx, and the Great Wall of China. The God of Rock is acting oddly though, and in a totally predictable twist, is discovered to be Lou, the Devil. 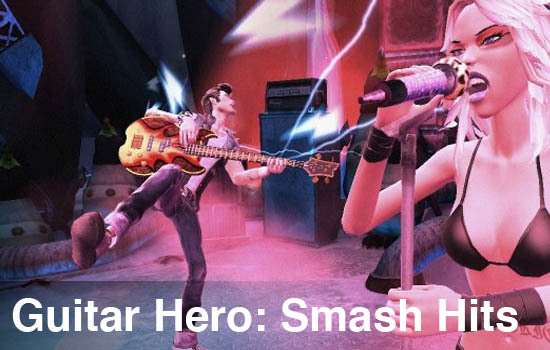 If this sounds more like Scooby Doo than a video game about rock and roll, well, it is. I find these cut scenes a bit disjointed from the rest of the game. While I don't care much either way, I think the games would be better off without the cheesy, tacked on storyline. On to the meat of the game, the songs. There is not a single song in the game that hasn't already appeared in one of the previous Guitar Hero games. 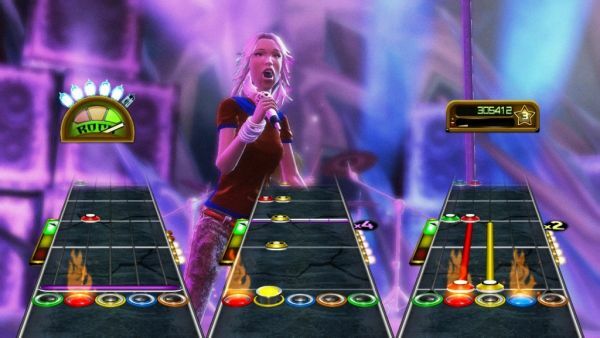 Ranging from the original Guitar Hero all the way through to the Aerosmith-centric game, that covers a period of releases from late 2005 to just over a year ago, in June of 2008. When it comes down to it, that's not very long. To the developer's credit, the tracks are weighted heavily to the first two Guitar Hero games. Each of these games has over a dozen songs duplicated in Smash Hits. GH3 and 80s have considerably fewer, and there is only one single song from Aerosmith. Including more older GH tunes was a wise move, especially for Wii and PS3 owners, who never had access to GH1 and GH2. The inclusion of a few songs from GH Rocks the 80s, a PS2 only title, was good for me personally, as I had already moved to the Xbox 360 when that game was released. These songs are more than just rereleases, however. For each, the original master recordings are used. It's difficult to remember, but the first two GH games were almost entirely composed of cover versions. Now that everyone has jumped on the music game bandwagon, original tracks are no longer a novelty; they are expected. Hearing the original artists on these songs is excellent. Some sound quite different than the covers did, which was a bit jarring when playing, as we were used to the cover versions. Of course, all of these songs now support the full band. You can sing and drum to your heart's content, adding two more players to the co-op. For most of these songs, this is the first time they have been available in full band form. This too adds value, or at least, the perception of it, to the "greatest hits" nature of the game. The co-op feel in similar games has always been strong, and Smash Hits is no exception. You still cannot use star power to save another player, though; it's one and done once again. I see no reason why this feature isn't included. Page created in 0.3789 seconds.